Very hardy and beautiful, bromeliads handle life differently than other plants. Most are epiphytic, their roots are little more than supports or hold-fasts. Their leaves do most of the work, appreciating part shade. In areas where rainfall is high, but seasonal, the leaves form a tank to collect and hold moisture. These tanks also catch the leaves discarded by the trees towering over them. As the detritus decays, the bromeliad leaves absorb the nutrients. 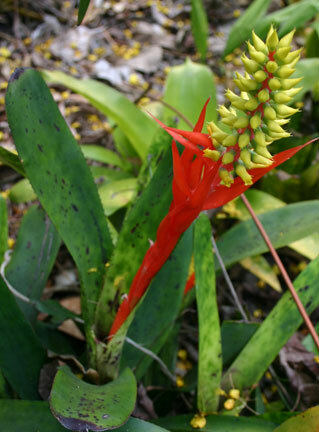 Bromeliads are adapted to making do with few resources and they do it very well. A fauna refuge: create a sanctuary for little frogs in the water-filled well of the Bromeliad. To use as a habitat for frogs: plant off the ground nestled in a tree, or in a shady spot around a water feature and remember to keep the vessel of the plant topped up with water. Likes deep shade to part shade and even a well-lit position, not direct hot sun. Preferably fairly humid, but will tolerate a dry atmosphere. Prefers an Orchid potting mix or a porous mixture such as equal parts bark chips, humus, peat moss and sand. During the growing season it is advisable to keep water in the funnel at the centre of the rosette all the time. If the plant is growing well but does not flower, try wrapping it in a plastic bag with some ripe apples for a few days. The ethylene gas released by the apples should induce flowering. Feed in spring and summer by spraying leaves with a weak seaweed solution.